When you get your puppy you will receive a detailed booklet (the instruction manual ) which includes detailed information about your puppy’s diet, toilet training, socialising, their parents and some general information which I hope you find useful. 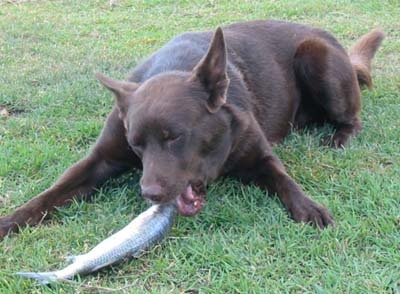 Below is some very brief information on what to expect with your Callicoma Kelpie. You will get much more information with your puppy. My dogs (including your puppy) are fed on a strict natural food diet. I avoid feeding commercial canned or dry food and any food with artificial colours, flavours, preservatives etc. I also do not use any chemicals (flea rinses etc) unless absolutely necessary. There are usually natural alternatives to most chemical treatments. My young dogs are now sixth and seventh generation of being raised in this way, and I find it keeps them incredibly healthy, reduces vet bills as well as reducing worms, fleas etc. You will receive a 1kg packet of Vets All Natural Complete mix with your puppy (if your puppy is being flown to you I will post this to you). You add the mixture to equal parts water and soak for 24hrs, then mix with your choice of raw meat. More information is provided on the pack as to how exactly to make it up and you will get much more information on feeding in the detailed booklet about your puppy. 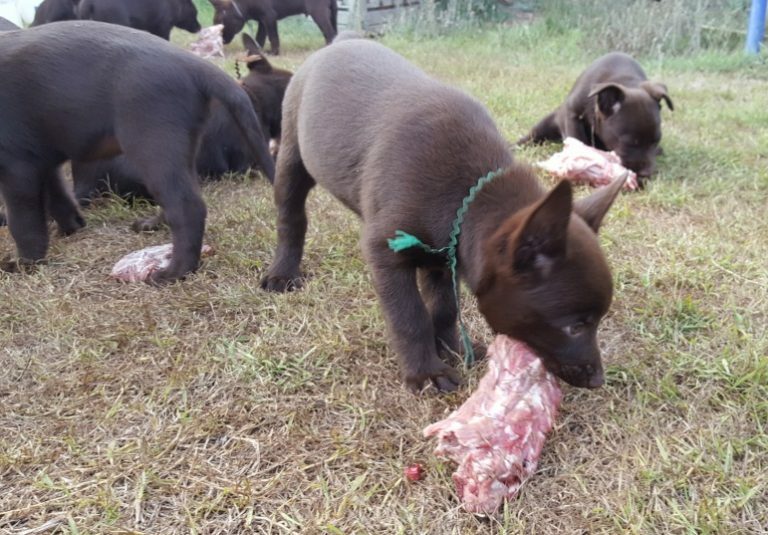 Your Callicoma kelpie will not just have eaten the Vets All Natural Complete Mix and raw meat, he/she will have eaten heart, liver, kidney, chicken frames, beef brisket, turkey necks and even whole (RAW!!) fish. All of these form a complete and balanced raw natural diet – just like your puppy’s ancestors would have eaten. I think it is very important to have a well adjusted, socialised dog that is used to being handled by lots of different people and used to as many things a baby puppy can safely be exposed to. This is important for obedience and showing and just as important (probably more so) for a family pet. Callicoma puppies are given “Early Neurological Stimulation”- a series of exercises developed by the US Army for their dogs. You can read much more about this in your puppy’s information book. Your puppy will also have had many trips in the car, which means the trip home will not be stressful, in fact they will probably sleep most of the way. 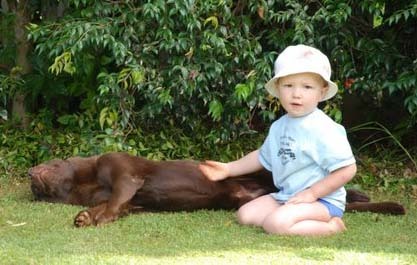 As the puppies develop they are handled all over by many people, including children. This means they love kids, but please be aware that all interaction between dogs and small children should always be supervised! 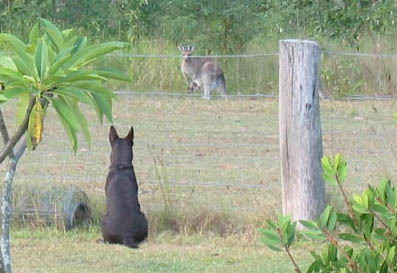 Your Callicoma kelpie will also be socialised with other breeds of dogs and other animals (chooks, cats, cows, wildlife etc). Callicoma puppies also get to play on many surfaces, have things to climb in/over/on and with. As I want my own dogs to excel at agility, they learn to play on equipment that might move is brightly coloured etc from very young dogs. 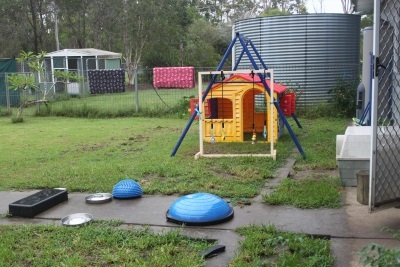 This is their play area where they spend the day time from 4 or 5 weeks old. 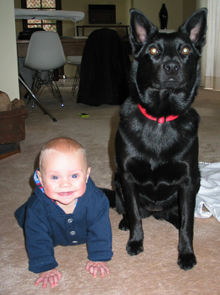 Your Callicoma puppy will have received the best of care between birth and when you receive him/her. They are wormed every 2 weeks, and puppies that stay with me for longer than the standard 8 weeks (ie if they are flying overseas) will start heartworm prevention and flea/tick prevention. You will receive detailed instruction on what treatment your puppy has had, and how to treat for worms, heartworms, ticks and fleas in the future. All Callicoma puppies are vaccinated with C3 and C2i before coming to you. 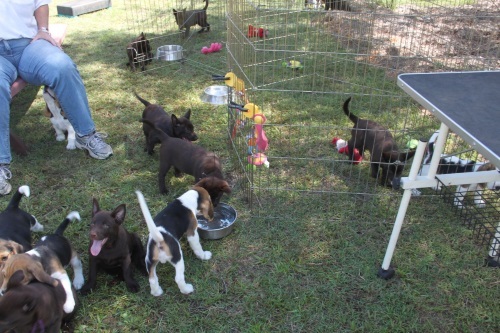 They all receive a full vet check at vaccination time as well. In your puppy book you will receive the vaccination certificate and detailed information on future vaccination needs and dates required. Microchip requirements vary between states. 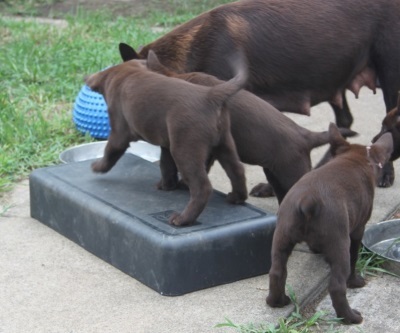 All Callicoma puppies are microchipped (I am an authorised microchipper) and you will receive detailed information about how to transfer the microchip details in to your name and what to do if you live in a state other than NSW. Your puppy can not leave here until he/she is at least 8 weeks old. This is something I can not change as is a requirement all registered breeders have to follow. It is there for a very good reason – the puppies learn lots of doggy body language from their litter mates and particularly from their mother in those last few weeks. They learn to respect what a growl means, and they learn that no one will play with you if you are too bossy or too rough. I believe it is very important that all puppies stay with their litter mates and preferably also with their mother until they are 8 weeks old. Of course some mothers will have had enough of the babies by then, but mostly my girls will keep feeding their pups and checking on them a few times a day right until they leave. We will work out a time that is suitable for you to collect your puppy. If your puppy is flying to you see below. When you come to collect your puppy please bring a towel or blanket – some sort of bedding that we can rub over mum before you leave. That way he/she can have the scent of mum to sleep with for a few nights when first alone. Please allow an hour here to go through all the information I need to tell you and to sign all paperwork. To travel home in the car your puppy is safest in a crate. Most Callicoma puppies will sleep soundly in the car when travelling as they had had so many car trips. Your puppy will weigh around 5kg. Do not bring a cat crate as it will be too small. 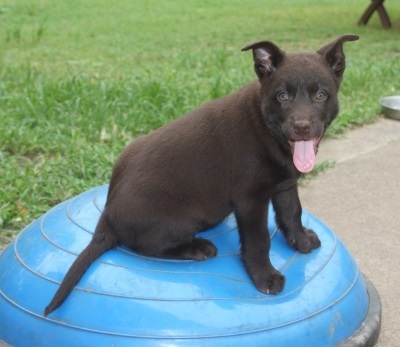 You can purchase a suitable crate (which your puppy can then use as a bed at night) from Callicoma Kelpies & Pet Supplies – let me know in advance. I am happy to sell these crates to my puppy buyers at cost price. 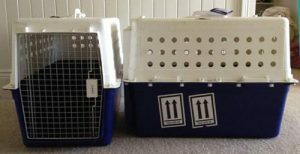 This is the type of crate your puppy will have been used to travelling in. If I am flying your puppy to you I will advise you of flight costs and we will arrange a mutually suitable date and time. Your puppy will fly in one of the crates pictured above. You can choose to hire a crate from the shipping company I use, or purchase one from me. You will find the purchase price (when getting it cost price from me) is only about $10 more than the hire price, and then you have a crate for your puppy to travel home in and to sleep in. If the crate is of no further use to you then by all means use a hire one. I just like to let people know all available options. If your puppy is flying internationally you do not have an option of hire – the shipping cost will include a crate from the shipping company. Please take water and a bowl to the airport as your puppy will have been without a drink for many hours. (Puppies on international flights will have been given water, but not those on domestic). I will place a blanket in the crate with your puppy which will have been rubbed all over mum, so take the blanket with you when you take your puppy. 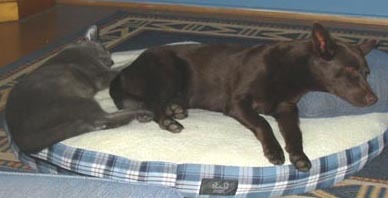 Even if it has been weed on (or worse) just cut that bit off and let your puppy sleep with the blanket for a few nights. When I send you flight details I will also advise on pick up place and any other information you need. Please note you will need photo id when collecting your puppy. If you have any problem (however small) once you have taken your puppy home please don’t hesitate to contact me. 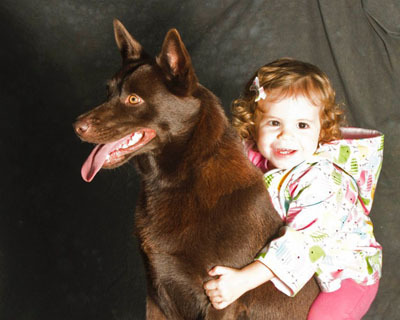 Your purchase of a Callicoma Kelpie includes lifetime support! Please keep in touch, I am always interested to hear of the progress of dogs I have bred. 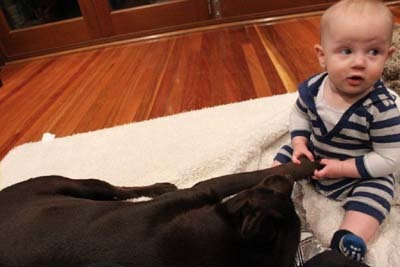 I hope your Callicoma kelpie brings you many years of pleasure and loyal companionship.